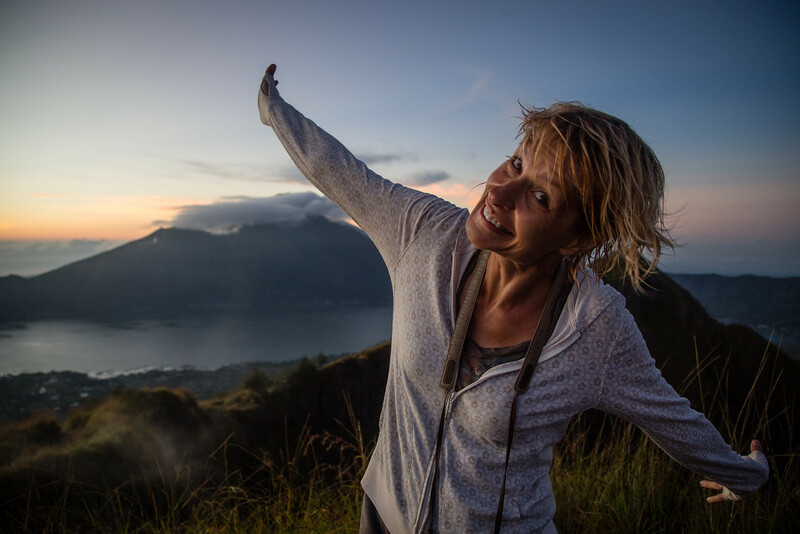 Since Mount Batur sunrise trekking tours start with a 2 AM hotel pickup on the coast, and because most of those tours don’t go to the summit, Sarah and I opted to spend the night before the climb at the base of the volcano. 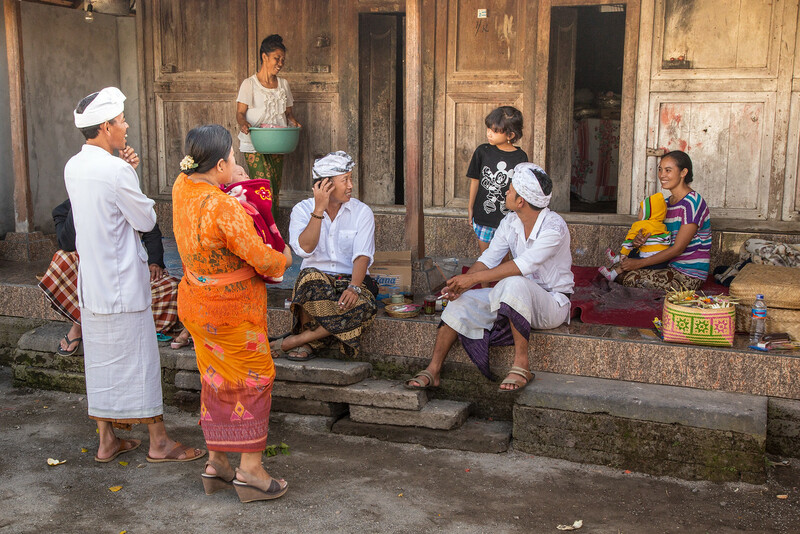 We found a beautiful, two-room guest house in the caldera, right on the edge of Lake Batur in the little village of Songan. There isn’t a lot to do in the tiny town, so we just walked along the lakeshore to take in the scenery. Serendipity often has me stumbling upon great things when I am on a little walkabout, and this time it had us stumble upon a friendly Hindu family celebrating at their private temple. When they saw that we were interested in watching the proceedings, we got invited inside to their home. We were sat down in a place of honor, given some tea and cakes, exchanged the stories of our lives and played with the children. Anyway, instead of a 2 AM loadup into a van, we got a 3:30 AM knock at the door by our guide, and our little adventure began. Even though we were squarely in the tropics, the altitude and the morning air made the temperatures pretty cold. The walk started off easy enough with just a few groggy stumbles by flashlight on a wide path on an uphill grade. The stars were out in force, and the Milky Way looked as if you could reach out and stir it. I was starting to feel quite confident about my fitness level, even as the grade began to increase. 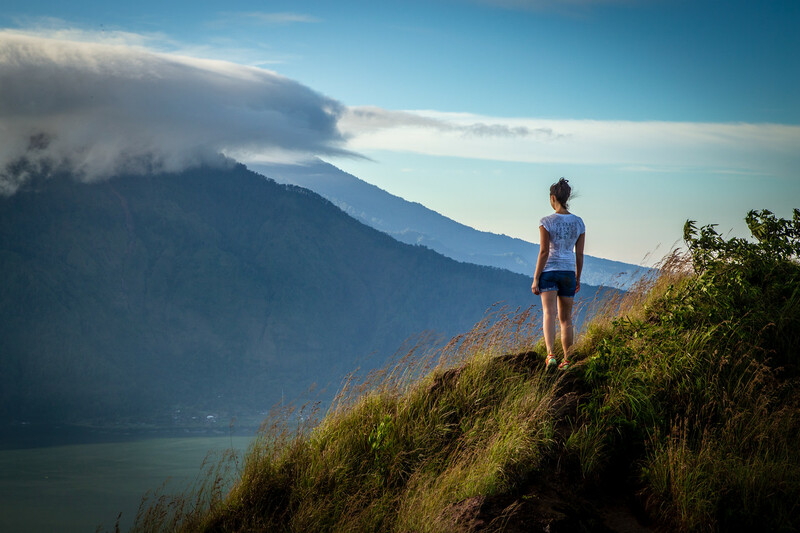 What Is It Like Climbing Mount Batur? Soon we were moving, still in the dark, through a humid, deep forest canopy, and up ever narrower trails. An easy walk soon turned into having to search with my boots, for unseen footholds to lift myself upward and maintain balance. Despite the still crisp air a trickle of sweat was falling down my back and making me clammy. My legs started to get heavy, and I began to question why I do these things to myself when I could be warm in bed somewhere, but at this point, we were out and on a mission. It didn’t take long until we were through the forest and we stopped for a quick rest. In the east, we could see the first signs of dawn. We began again, and our guide started doing a countdown of sorts for us — “30 minutes” then 20 minutes later, “only 20 minutes!” 15 minutes later, “just ten more minutes.” We were getting onto his game. Sweat was running down my face and getting in my eyes, my legs were burning and my knees were throbbing. The sky was lightening further, and soon we were able to put away our flashlights and navigate without them. Finally, as we topped what felt like an almost vertical climb we could make out our destination; the top of Mount Batur. Sunrise from Mount Batur Volcano. On the right in Mount Agung. Just below the sun, you can see a reflection off of the Bali Sea. In the middle, on the horizon, is the island of Lombok. Steam is from volcanic vents. 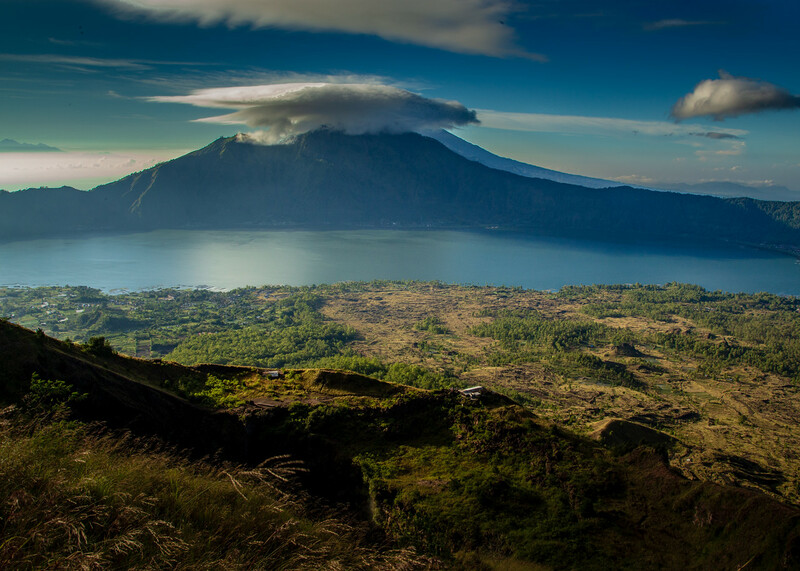 Lake Batur and Songkan are at the bottom of the caldera. As we approached the summit, it appeared that the air was thickening with a warm fog. There was a stiff breeze blowing, and I went from being chilled from the combination of sweat and wind to being warmed by the mist as patches floated past. We weren’t the first people at the summit, but we did beat sunrise by about 30 minutes. I bought myself a cup of instant coffee and Sarah a weak cup of tea from the makeshift restaurant at the top and found a bench where we could celebrate, rest, talk with our fellow trekkers and wait for the sun. As visibility increased I saw that what I thought was warm fog was in fact steam escaping from the volcanic vents that were set in crevices and hidden behind foliage in meadows near the peak. The outline of Mount Agung’ Bali’s other active volcano started to become visible as the stars faded into the yellowing sky and finally it was time for the main event. As the sun rose, we could see reflections from the Bali Sea and even further in the distance the Indonesian Island of Lombok. We just sipped our drinks and marveled at how beautiful everything was. As the sun rose higher, we could begin to pick out the starting point of our hotel, far below, on the shore of the lake. This was the payoff for all the effort and discomfort. Again, the challenge was worth it, and all doubts of our sanity were washed away. We were only halfway through the adventure (what goes up must come down), and I had that satisfied feeling that I was happy to be out doing something worthwhile with my time and my retirement. We had made it! We had climbed to the top of Mount Batur. Our legs ached, and it was a bit chilly, but we were basking in the glow you get from accomplishing something that challenges you and pushes your boundaries. We had made it to the peak of Mount Batur, and we were starving. 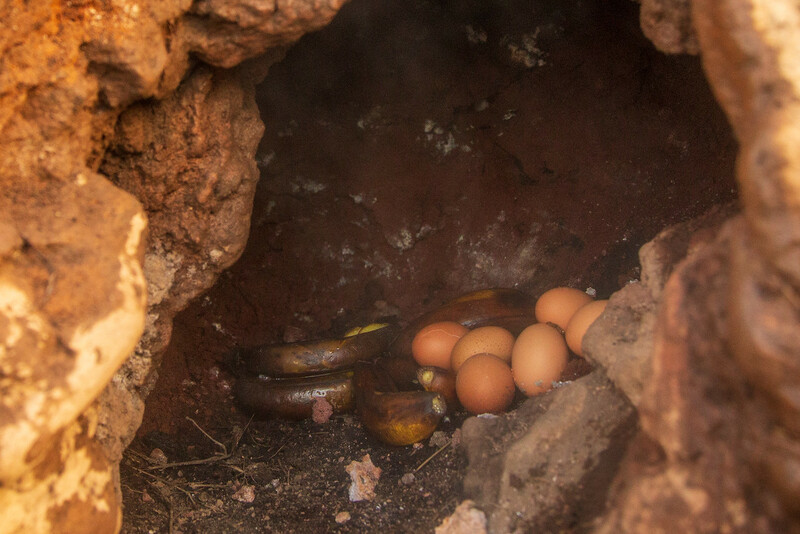 There is a tradition when you go hiking Mount Batur that says at the top your guide must prepare you a meal of steamed eggs and bananas in one of the volcano’s steam vents and he did. Okay, it wasn’t exactly gourmet fare but given how hungry we were it was certainly welcomed and we gobbled down about three eggs and three banana sandwiches each. Even the instant coffee and tea tasted pretty good under the circumstances. We were enjoying the panoramic views of Bali and other far away islands and enjoying the company of our fellow hikers, but eventually, we had to leave. You always hear stories about the challenges of climbing up mountains but rarely do you hear about the descent. As we started southwest from the summit, we quickly became aware that going down might not be as physically demanding but would require a different kind of strength. Leaving from this point necessitated that we walk a trail, sometimes less than a foot wide, along the spine of the crater with 100-meter drop-offs on both sides. There was nothing to hold onto, and the wind was starting to pick up and trying to blow us off balance. I was grateful for the morning light that I needed to see the trail, but it did make graphically visible what would happen if I made a misstep. There were a few people who began hiking Mount Batur with us who opted to turn around and retrace their steps back to the bottom. Honestly, I admired the bravery it took for them to admit this wasn’t for them and turn around. This was no place for acrophobics. We had opted to take the longest route but didn’t realize that it involved this sort of terrain. It was stunning and I never really felt too scared, but I did use a lot of caution. I did manage to make a few images along the way, but on the narrower and steeper parts, I was too afraid to raise the camera for fear of losing my footing when I took the shot. We could smell sulfur from the earth and see the steam from even more numerous vents now. It was almost otherworldly. Eventually, we descended — sometimes climbing down hand over hand on the bare rock face, sometimes trudging and sliding along paths covered in fine black ash, other times along wide, well-groomed trails — into a rough lava field that was formed only a decade ago. The hardest part was over, and soon we found ourselves in a developed rest area filled with monkeys. I guess I shouldn’t be surprised to be stumbling across monkeys in Asia, but it does sometimes seem that they are as common here as squirrels are in the United States. Squirrels are pretty cunning and mischievous but imagine if you gave them bigger brains and opposable thumbs. 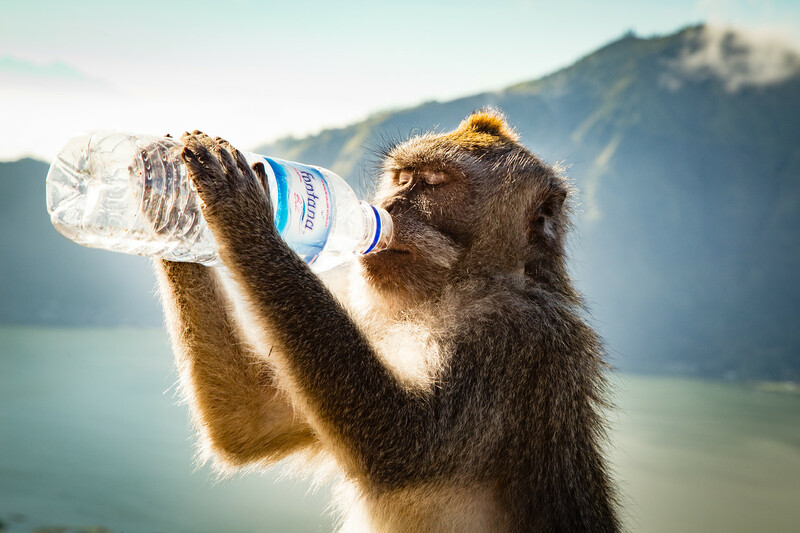 I was tired, and I was thirsty, but one of these pesky primates thought they needed my bottle of water more than I did, stole it from my bag and then posed for the camera while he drank it. It was a funny way to end another great day of this retirement adventure! How do I get to Mount Batur? There isn’t a marked path up to the summit and as you will be starting the trek in the dark, it’s best to use a guide. The easiest way to go Mount Batur Sunrise Trekking is to book a tour. The price of your tour will include a pickup from your hotel, but the pickup time is around 2 AM. 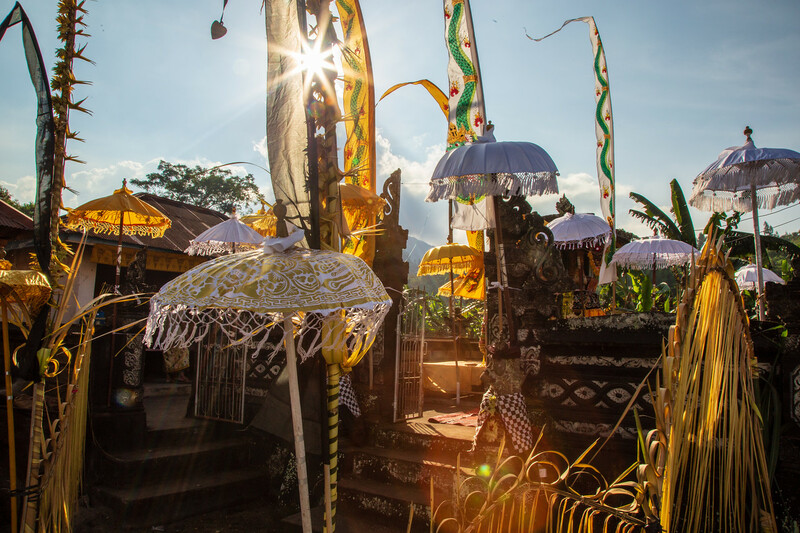 If like us, early mornings aren’t really your thing, consider staying at one of the many hotels or guesthouses near the base of Mount Batur in Songan. Your guesthouse can arrange a guide for you. Obviously, it’s still going to be early, as the sun tends to rise before 10 AM, but you will be waking up at a more respectable hour and can walk straight up from your guesthouse. 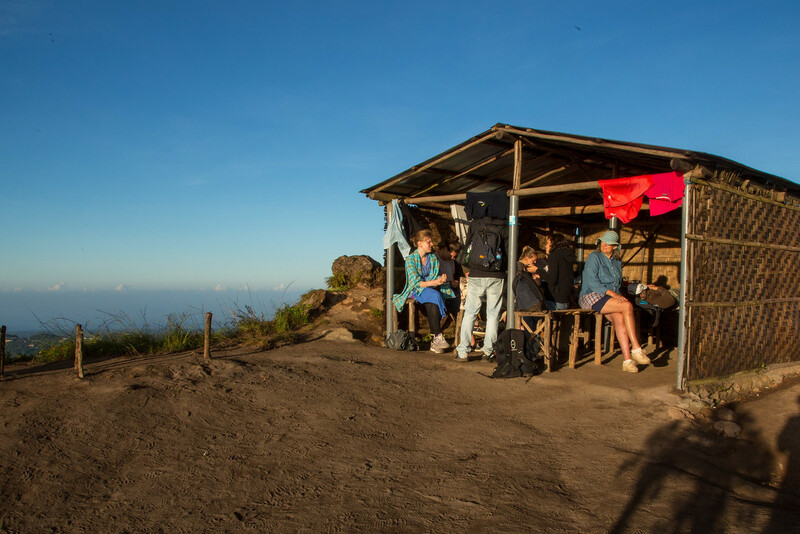 Prices for trekking up Mount Batur vary, but expect to spend somewhere around $55 USD per person for entrance fees and a guide. 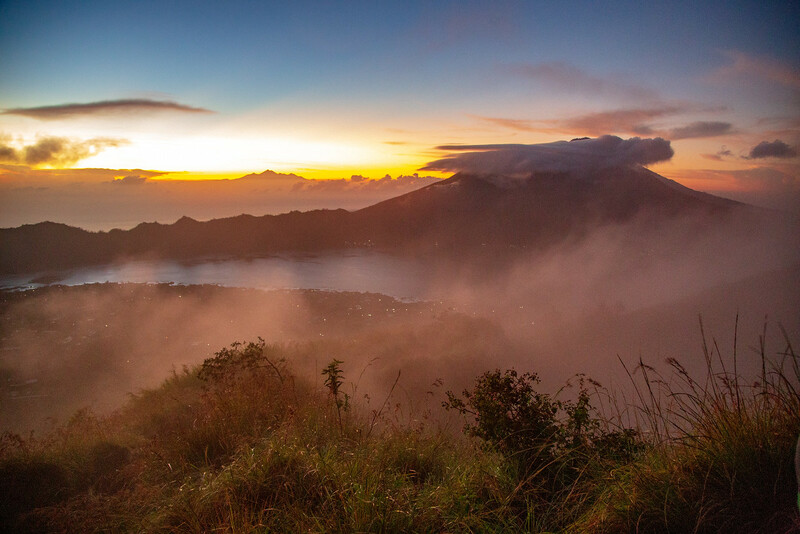 When is the Best Time to Hike Mount Batur? 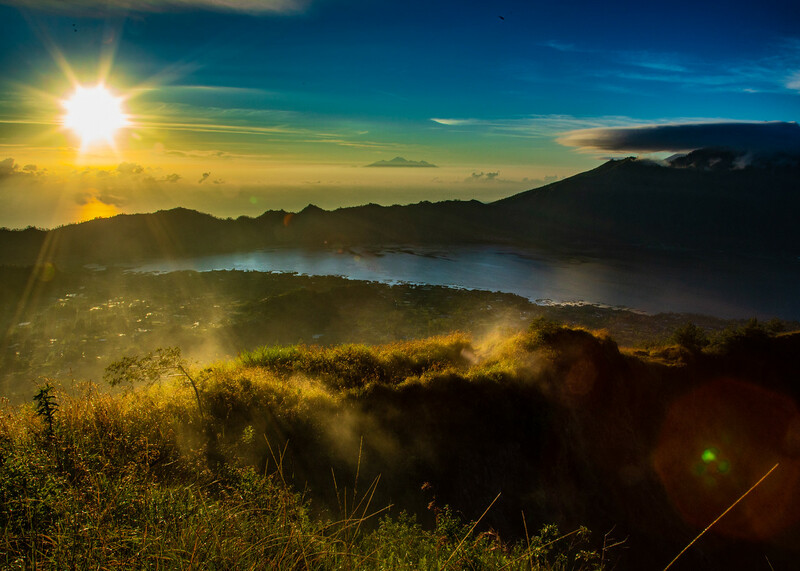 The best time for Mount Batur sunrise trekking is from May to September, the dry season in Bali. We hiked in May which was a perfect time. You wouldn’t want to climb a volcano in the dark when it’s raining. Sunrise at Mount Batur can be chilly so it is best to wear layers. It will a bit chilly when you start the trek but as you climb, you will start to warm up but once at the top of the volcano and waiting for the sun to rise, you may need to start putting on the layers again. Running/walking shoes are ok, you don’t need proper hiking shoes for this hike but if you have them, even better. Don’t forget to bring a torch/flashlight. 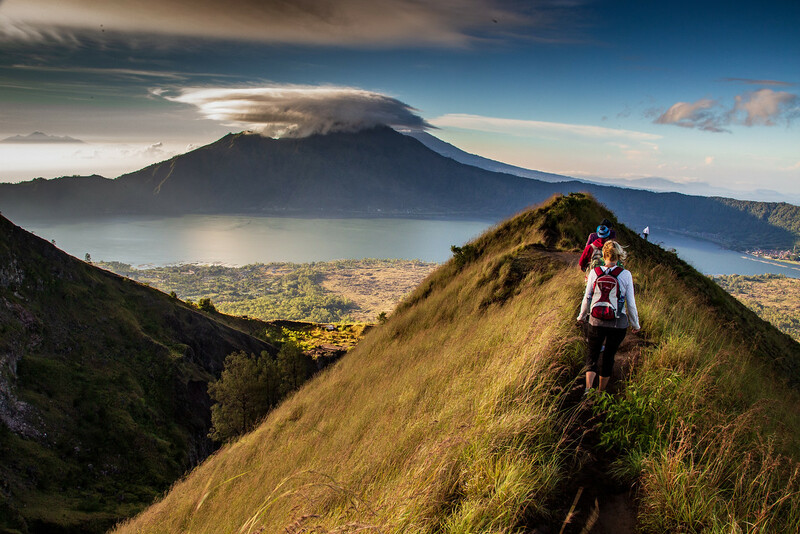 How hard is the Mount Batur Sunrise Trekk? Well, that depends on your physical ability, we wouldn’t say that it was difficult but it’s not easy either. Call it, I don’t know, moderately easy. It takes about two hours to reach the summit in the dark.